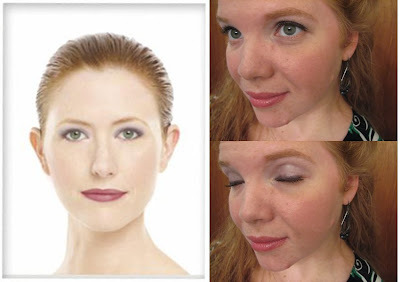 KYredhead's Beauty Blog: Photos and Makeup and Hair — Oh, My! Photos and Makeup and Hair — Oh, My! The overhauled virtual makeover program on my Personal Website is astonishing. I have played with several online makeover programs over the years, and there's always been a favorite feature from each one. Well, our new virtual makeover program has all of them — and I mean all. You can choose your highlighter, midtone, and accent eye colors, plus adjust the amount, placement, and application technique for each. You can apply your mascara three different ways, in addition to specifying the color and amount used. You can basically customize every single aspect of your cosmetic application, from drag-and-drop cheek color placement to lip liner intensity. If all those choices seem overwhelming, you can try out seven different complete looks created by professional makeup artists! You can even upload your own photo, save all your different looks, and e-mail your makeovers to your friends. And did I mention the hair? You can also try out different hairstyles and colors — even adjust your highlights and lowlights! As you choose the different colors in your makeover, each one is added to your "virtual compact" right on the screen. You can save your makeover, view your before and after pictures, or even print your pictures with a shopping list! If you choose to use your own photograph instead of one of the 24 models provided for you, the program gives you tips on taking/choosing an appropriate shot and walks you through mapping your features so the makeup gets applied correctly. One important note: the makeovers do not include concealer, foundation, powder, or brow liner, so you'll want to take your "bare-faced" picture after applying those things in order to see a truly accurate makeover. I don't know many people who wear color cosmetics but not foundation. Since I love and trust my dear husband, I let him play on the virtual makeover program, too. He created the look on the left just for me! How special is that, to know that your loved one designed a makeup look for you? He made some very bold choices, including some colors I'd never tried before, but I was brave enough to try it. I didn't apply eyeliner underneath my eyes, and my lip liner was a little less heavy-handed than it was on the model, but otherwise this is the look that he made! It was fun to branch out. One word to the wise: if you use one of the dark matte eye colors, please start s p a r i n g l y...that stuff is potent. My own dear mother got into the makeover game as well! (You're given fair warning — it is pretty addictive.) Here are some of the new looks she created for herself! You can tell she had fun with the hairstyle options. And she "tried" some new colors she might never have considered before! Click on the picture to see an enlarged version. Wanna know the best part of the whole thing? When you find a look you like, you can try it on your face for FREE!!!! Just contact me (or your personal beauty consultant, if you have one) to set up a customized color appointment, and I'll show you how and where to apply everything to get the look you want! And if you have some friends or co-workers who get hooked on the virtual makeover game, you can invite them to join us and earn your compact free!